"Esteemed Mr. George W. Bush, the chief prince of Meshech and Tubal (Ezekiel 38:1), leader of the west!" 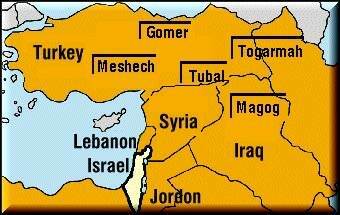 Meshech and Tubal has eluded me as to the direction that they went until now. Genesis 10:1 Now these are the generations of the sons of Noah, Shem, Ham, and Japheth: and unto them were sons born after the flood. 2 The sons of Japheth; Gomer, and Magog, and Madai, and Javan, and Tubal, and Meshech, and Tiras. 3 And the sons of Gomer; Ashkenaz, and Riphath, and Togarmah. 4 And the sons of Javan; Elishah, and Tarshish, Kittim, and Dodanim. 5 By these were the isles of the Gentiles divided in their lands; every one after his tongue, after their families, in their nations. Ezekiel 39:1 Therefore, thou son of man, prophesy against Gog, and say, Thus saith the Lord GOD; Behold, I am against thee, O Gog, the chief prince of Meshech and Tubal: 2 And I will turn thee back, and leave but the sixth part of thee, and will cause thee to come up from the north parts, and will bring thee upon the mountains of Israel: 3 And I will smite thy bow out of thy left hand, and will cause thine arrows to fall out of thy right hand. Ok, I'm not sure that the US is Gog. I also think that the Rabbi's may be wrong. Take a look at the maps and see where Meschech and Tubal are located. I have never seen where the West would be in the end times within scripture.